The BPM-X converter is able to read and write native Visio diagram files and translate them bidirectionally into tools like SAP©, Software AG ARIS©, Opentext ProVision, IBM BlueWorks Life©, Unicom (ex IBM) System Architect©, Sparx Enterprise Architect©, CaseWise© and many others. The tool is developed in C++ and directly writes to the complex data structure of different XML files in the VSDX file archives. With the direct support of the Visio XML XSD schemes there is no Visio required on the desktop to create VSDX files. 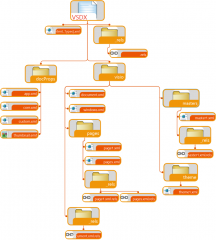 The native support of VSDX archives allows batch processing of large numbers of diagrams for reading and writing of VSDX on the fly. 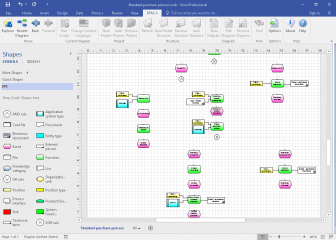 The result are Visio diagrams with the notation of the source tool. The following example shows an ARIS© diagram in Visio 2016. By use of batch processing complete ARIS databases can be converted to Visio. TransWare carefully researched the Visio 2013 and Visio 2016 file versions of VSDX and proved their compatibility on data level. This means Visio diagrams may be edited with both Visio versions without difference or limitation.